The French Riviera… two luminous stars (Grace Kelly, Cary Grant)… and the Master of Suspense, Alfred Hitchcock, behind the camera. They all add up to one romantic, dazzling screen thriller. 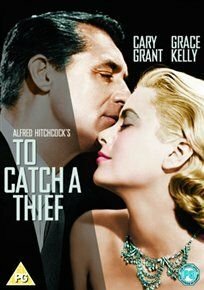 Grant plays John Robie, a retired jewel thief once known as “The Cat”, who catches the eye of Frances Stevens (Kelly), a pampered, vacationing heiress. But when a new rash of gem thefts occurs amongst the luxury hotels of the spectacular French playground, it appears that “The Cat” is on the prowl once again. Is Robie truly reformed? Or is he deviously using Frances to gain access to the tempting collection of fabulous jewellery belonging to her mother (Jessie Royce Landis)? Romantic sparks fly as the suspense builds in this glittering Hitchcock classic that nabbed an Oscar for Best Cinematography. A stone cold classic from Hollywood's golden age!